Romitaman Original Comic Book Art :: Private Collection :: Amazing Spider-Man #49 p 14 (Large Art) 1967 SOLD! 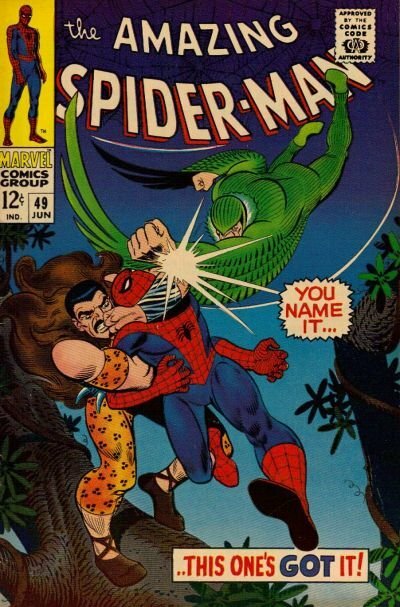 by artist John Romita Sr.
Click Here To See Amazing Spider-Man #49 Comic Book! John Romita pencils, from the CLASSIC (LARGE ART) 1967 AMAZING SPIDERMAN story titled: "From the Depths of Defeat!" The "ONLY" Large art Romita ASM page EVER where Spider-Man battles AND punches 2 major villains on it! John Romita only drew 300 LARGE ART ASM pages and this right here ranks at or near the TOP! This is the best of the best when it comes to John Romita ASM art folks. ALL art on our website (including this one) are able to be purchased with VERY fair time payments, and trades are always considered towards "ANY" art on our website! Just send us an email to mikeburkey@aol.com and we can try to work something out.